Ema are small wooden tablets used in Shinto shrines to write your wishes and prayers. You can buy a blank tablet in the shrine shop, write your wish on it, and put it on a stand near the main shrine building. Currently this feature doesn’t affect your relationship scores in any way, it was added for authentic recreation of a typical Shinto shrine. Since a few people were confused in the past by the rules for pocky/kissing mini-game, now there is an optional training mode. You can use tomatoes to train your kissing skills before using them on your girlfriend. The platform for tomato training is located near the convenience store entrance. All brick textures in all locations are replaced with new higher quality ones. In dakimakura dating mode your pillow in inventory is now called by her name (in item description window). Fixed the bug with wrong squirrel colors. 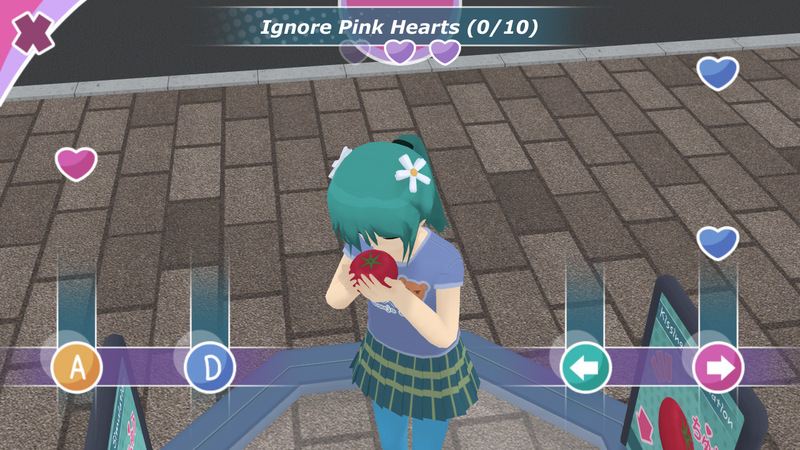 Fixed texture for umbrella with pink hearts. All translations are updated according to their current status in the game wiki. Thanks to contributors, French was added to the list of game languages. This update also contains numerous small fixed typos and other corrections for various translations. This update is available in Steam Early Access version of the game. Every bought copy of the game is a direct contribution towards the future development of this project. If you like how this game is shaping thus far and want to see it living and developing, please support it on Steam! I don’t have any fixed minimum or maximum budgets – whatever the game earns through Early Access sales will be invested into it, and that will directly affect what kind of quality and overall scale the game will reach by 2020. Even if the game doesn’t earn anything at all within next two years, the development still will go on – with whatever amount of time I will be able to dedicate to it. But on a much smaller scale, and it would take way longer than two years for Akihabara location to arrive, of course. А можно скачать версию 0.5 бесплатно? Нет. Все чего можно было достигнуть на одном энтузиазме и без денег уже сделано. Для дальнейшего развития проекта и завершения в разумные сроки (2-3 года) нужны деньги. Все полученное от продаж в Стиме будет вложено в дальнейшее развитие игры. Если продаж не будет то и никакого будущего и развития у этого проекта не будет, ни в платной ни в бесплатной версии. Creating a male character would require to stop working on all other aspects of the game and spend next two-three months (at the very least) to design a new character model, make new bone animations, new blendshapes (face emotions), hairstyles, clothes and accessories, and changes to code and texts. A lot of work for a feature that won’t even have any additional gameplay time. That’s why it’s one of features on the “low priority goals” list. I think that adding more gameplay, so that people have more stuff to actually do in the game (e.g., school clubs) is way more important now, so that’s what I’m currently working on. Скажите пожалуйста! А будет ли бесплатная (демо) версия и дальше обновляться или вся работа сейчас у ходит на платную версию? Бесплатная версия тоже будет обновляться. После того как купить игру она будет сама обновляться? For people who don’t want or cannot buy Steam version there is a free demo version. When will the update in demo version? Update schedule for the free version is about the same as for the Steam version +/- a few days.